Om Nom Stories and Om Nom plushie giveaway! Here's a cute little video, called Om Nom Stories, of the candy-eating little creature from the popular iPhone and iPad game Cut the Rope. Admit it, this video makes you want a pet Om Nom! 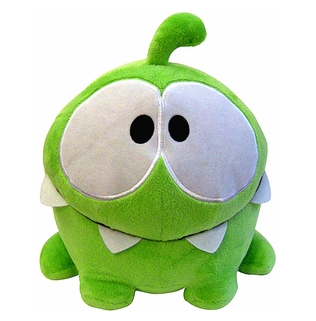 Speaking of Om Nom and his cuteness, ZeptoLab has given us some Om Nom plush toys to give away! Specifically, we've got one 5", one 8", and one whopping 16" Om Nom to put into your Om Nom loving hands! For a chance to win, head on over to our forums and let us know what you love about Om Nom. In the mean time, if you haven't already, go pick up Cut the Rope for iPhone or iPad and feed Om Nom some candy. He's hungry.